The Study in a Second Discipline Fellows Program, which is sponsored by the Office of the Senior Vice President for Academic Affairs and Provost, is an interdisciplinary teaching and research program that offers tenured faculty the opportunity to immerse themselves in a field outside of their primary disciplines. 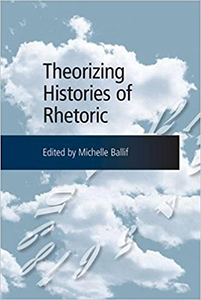 UGA’s English Department has had many such fellows, including Department Head Michelle Ballif, who studied Classical Art History in 2002-2003. Faculty learning outside of Park Hall has fostered countless interdepartmental connections, exciting research, and new professional opportunities. Professors return to the classroom with new insights and new areas of expertise. Dr. Elizabeth Kraft, a specialist in eighteenth-century literature, studied Film under the direction of Richard Neupert (2002-2003). In addition to courses in the Department of Film and Theatre, Dr. Kraft enrolled in courses offered by Comparative Literature, Romance Languages, and History. While her studies quite directly led to the publication of an article on All the President’s Men (2008) and a book monograph, entitled Restoration Courtship Comedies and Hollywood Remarriage Films: In Conversation with Stanley Cavell (Routledge, 2016), her studies in film theory and cinematic history also led Dr. Kraft to develop new classes for the department and to become actively engaged with community outreach via the Athens Jewish Film Festival. Dr. Andrew Zawacki, a poet, professor, and translator, teaches courses in a wide range of subjects in the English department, including creative writing, contemporary American literature, and literary theory. Dr. Zawacki studied photography in the Lamar Dodd School of Art with program director Michael Marshall and worked closely with faculty members Stephen Scheer, Marni Shindelman, and Ben Reynolds (2013-2014). Dr. Zawacki continues to be in contact with all four of these photographers, who consistently extend their generosity, expertise, and enthusiasm when he solicits them for advice pertaining to photographic traditions and trends, professional opportunities and equipment. During his fellowship year, Zawacki’s book project Paris Photo Graff reached an advanced stage, and he has since presented his work at Harvard University, where the Woodberry Poetry Room invited him to speak about poetics, and at Southern Methodist University, whose Graffiti Research Cluster concluded its yearlong seminar series with his presentation. Two faculty members, Dr. Sujata Iyengar and Dr. Beth Tobin, held Fellowships during the 2014-2015 school year. Dr. Iyengar, a scholar of the Renaissance period, took classes in Book Arts and Letterpress printing at the Lamar Dodd School of Art. 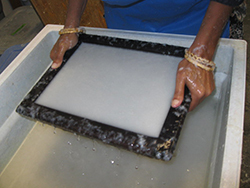 Dr. Iyengar spent her year apprenticing with Eileen Wallace and learning about the practices of printing, bookbinding, type layout, imposition, and design. Her current scholarly monograph project, “Shakespeare and the Art of the Book,” investigates our changing understanding of the material qualities of the codex (the bound book) and of information transfer in rapidly developing publishing environments. Dr. Iyengar attributes her willingness to incorporate arts-based experiential learning into her own scholarly research to her fellowship year, during which she also began publishing original poetry, something that she never expected or thought she even wanted to happen. Dr. Tobin, a scholar of Eighteenth-Century British Literature, studied insect morphology, taxonomy, and the methods by which entomologists collect their specimens with faculty in the College of Ecology and with curators at the University of Georgia’s Natural History Museum. Dr. Tobin is writing a book on John Abbot (1751-1840), a natural history artist and naturalist, who produced thousands of watercolor drawings of insects. Abbot’s drawings are housed in great natural history museums in London, Paris, and Washington, D.C. and in the rare book libraries of Harvard, Cornell, Johns Hopkins, and Emory, to name a few. 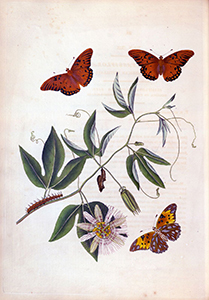 The University of Georgia’s Hargrett Library has over six hundred of his drawings, plus a spectacular and very rare vellum copy of his book, The Natural History of the Rarer Lepidopterous Insects of Georgia (1797). Dr. Tobin curated an exhibition at UGA’s Special Collections Library of Abbot’s insect and bird drawings, an exhibit visited by every student from local middle schools. In addition to delivering several papers at international conferences and publishing two short essays, Dr. Tobin continues to work on a book that situates Abbot within the larger context of Enlightenment art, natural history, and the cultures of collecting. Dr. Roxanne Eberle, a Romanticist, spent 2016-2017 studying Digital Humanities with Emily McGinn, Director of UGA’s DigiLab, and Dr. Scott Nesbit, a professor in the College of Environment and Design. 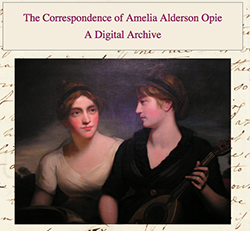 By the conclusion of the school year, Dr. Eberle had become proficient in TEI, the Text Encoding Initiative developed for humanist scholarship, which allowed her to begin actively preparing the manuscript letters of Amelia Alderson Opie (1769-1853) for online publication. In addition to establishing The Correspondence of Amelia Alderson Opie: a digital archive, Dr. Eberle attended an NEH summer seminar in building digital editions sponsored by the University of Pittsburgh in the summer of 2017. Dr. Eberle’s work with the archive has led to collaboration with scholars in both the United Kingdom and Canada, and this past spring, she presented her research at the British Women Writers Conference in Austin, Texas. Dr. Aidan Wasley is spending the current academic year working in the Hugh Hodgson School of Music. Dr. Wasley is researching links between twentieth-century music, poetry, and film in support of a book project called Mid-Century Modernisms, which explores the links between a range of émigré writers, artists, and composers – including Auden, Hitchcock, and Stravinsky – in the years during and after the Second World War.